How serious a matter is humanity’s increasing usage of energy? Will “business as usual” find suitable ways to keep on supplying sufficient energy in response to market needs, or is some special concerted action necessary? If some special concerted action is required, what should that be? For example, should extra priority be placed on nuclear energy, solar energy, wind power, selected new biofuels, or what? When I picked up the latest Scientific American, I experienced a short flush of optimism. The cover story is “A plan for a sustainable future: How to get all energy from wind, water and solar power by 2030”. Mark A. Delucchi is a research scientist at the Institute of Transportation Studies at the University of California, Davis. In 1956 the U.S. began building the Interstate Highway System, which after 35 years extended for 47,000 miles, changing commerce and society. I read the article carefully. It all seemed to make good sense to me. But then I looked on the Scientific American website, at the online comments for this article. And then things seemed much less clear. and continues by dismissing the potential for solar energy too. Instead, nuclear energy is recommended as the best way forwards. 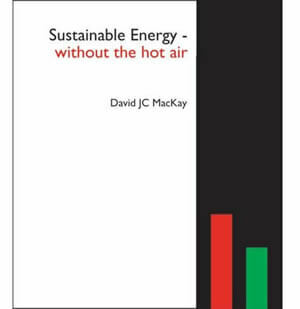 The article is in direct conflict with David JC MacKay’s book: “Sustainable Energy – Without the Hot Air” (which is available free online). He does a detailed analysis of many renewable and not-so-renewable sources of energy, and the basic conclusion is that without nuclear, it doesn’t work. My question for the authors and SciAm editors, is “what are we poor non-scientists to make of all of this?” We don’t have the resources or time to compare these conflicting books/articles head to head. You could do us a tremendous service, and help the public debate along by doing so. We are inundated with conflicting information that we cannot verify, so each faction picks the data that serves its ends, and blathers away on some TV show, then some politicians simplify it even more, and use it to push an unknown agenda. And so the debate continued. Happily, the book mentioned in this comment – “Sustainable Energy – Without the hot air“, authored by Cambridge University Physics Professor David MacKay – looks like being a significant step forwards. I remembered that my long-time friend Martin Budden, whose opinions I greatly respect, had already recommended this book to me. This book is available for free online. For ease of reading, I bought a bound copy today on the way home from central London. I recently read two books, one by a physicist, and one by an economist. In Out of Gas, Caltech physicist David Goodstein describes an impending energy crisis brought on by The End of the Age of Oil. This crisis is coming soon, he predicts: the crisis will bite, not when the last drop of oil is extracted, but when oil extraction can’t meet demand – perhaps as soon as 2015 or 2025. Moreover, even if we magically switched all our energy-guzzling to nuclear power right away, Goodstein says, the oil crisis would simply be replaced by a nuclear crisis in just twenty years or so, as uranium reserves also became depleted. Are you eager to know the end of the story right away? Here is a quick summary, a sneak preview of Part II. Second, to supplement solar-thermal heating, we electrify most heating of air and water in buildings using heat pumps, which are four times more efficient than ordinary electrical heaters. This electrification of heating further increases the amount of green electricity required. Third, we get all the green electricity from a mix of four sources: from our own renewables; perhaps from “clean coal;” perhaps from nuclear; and finally, and with great politeness, from other countries’ renewables. Among other countries’ renewables, solar power in deserts is the most plentiful option. As long as we can build peaceful international collaborations, solar power in other people’s deserts certainly has the technical potential to provide us, them, and everyone with 125 kWh per day per person. So far, so good. I particularly like the level of clarity and intellectual rigour in what I’ve read of the book so far. I hope my new flush of optimism doesn’t deflate in the same way as before! From 10.45-12.15 there’s a debate ABUNDANT, CHEAP, CLEAN…CONTENTIOUS? WHY IS ENERGY A BATTLEFIELD TODAY? From environmental to security concerns, energy is a big issue – how much, where from and what type?We are warned that coal is dirty, oil is running out, and nuclear is risky, so what is the future of energy?Will new sources of energy boost human prosperity, or simply accelerate the destruction of the planet? This is followed, from 13.45-15.15, by a debate THE NEW NUCLEAR AGE? Nuclear energy is championed by some as the best way to meet rising power needs while protecting the environment, but others are anxious about the risks. Could nuclear power create a more resilient energy system and bring energy to the developing world, or is it a disaster waiting to happen? Finally, from 15.45-17.15, the afternoon rounds off with a debate HOW TO SOLVE THE ENERGY CRISIS: MORE THAN LIGHTBULBS AND LIFESTYLE? Campaigners and politicians urge us to use less energy day-to-day, but can individual consumers really make a difference? Is it time to change the expectation that economic growth means ever more, and carefree, energy use? Or can we aspire to a future where we are not obsessed with reducing consumption? Two of the speakers in these debates are James Woudhuysen and Joe Kaplinsky, authors of the book “Energise – the future of energy innovation” which I’ve previous mentioned. The speakers as a whole cover a large range of opinions. Hopefully the “battle” will generate light as well as heat. Very surprising information. My main issue with nuclear energy is the lack of a sustainable method for processing the waste by products….but I had no idea that we had a relatively limited supply of fuel. I can’t see the logic in replacing an oil crisis with a uranium crisis. Any solution put forth to deal with the oil crisis must be sustainable. Ken, I’m sorry, in my original version of my blog post, I unintentionally allowed a misleading remark from the online comments section of the Scientific American to paint a false picture of the recommendations made in David MacKay’s book. I’ve amended my post this morning to try to clarify this. I too recommend David MacKay’s book. As you’ve articulated, much of the problem with this debate is getting people to express things numerically and in a broad enough context. David MacKay does a good job of that. Scientists for Global Responsibility at which the general thinking was similar. I still think that the solution is a mixture of actions and not amenable to description in a slogan or sound bite. Therefore the kluge that is collective human intelligence dithers. That’s a handy turn of phrase! There have been many advantages, throughout history, to this collective dithering. That has allowed important dissident voices to stay alive. I’m a big fan of scepticism – especially when that scepticism is based on reason and is constructively motivated. I agree about skepticism and diversity of argument. But it is desirable not to defer decisions until catastrophe. Dithering can be useful, but total inaction yields no new data to provide clarity. So at whom must this better communication be aimed? My concern is with the political community. They acknowledge the problem but have so far failed to act effectively. What influences politicians seems shrouded but I think in part the problem is the dichotomy between physical science and classical economics. The latter assumes an infinite supply of energy and raw material. It appears to have worked in the past and remains influential in political thinking. It would be nice to be able to demonstrate that the actions needed to deal with the energy problem and the greenhouse gas problem also stimulate prosperity. But instead the solutions are often presented by politicians in terms of sacrifice and austerity because our measures of prosperity are still based on classical economics. Yes, I’m sure that’s the key. Something like Obama’s green energy stimulus package should be the way forwards. One of more controversial conclusions of some environmentalists (James Lovelock, Stewart Brand, etc.) is calling for more nuclear energy – and a big problem in this area is the wide gulf between public understanding and what actually goes on in nuclear power plants. This gap extends even to the scientists, reporters, pundits, politicians and activists who consider the issue, since they draw their information from dry reports and quick site visits instead of any first-hand knowledge of how atomic reactors are run day to day. My book “Rad Decision: A Novel of Nuclear Power,” which is designed to address that knowledge gap for interested parties of all persuasions. I’ve worked in US nuclear plants over 20 years and my novel covers the people, politics and technology of this energy source in a way only an insider can, looking at both the good and the bad. “Rad Decision” is free online (no advertising, no corporate sponsorship), and is also in paperback. See the homepage for reader comments – they seem to like it for both its information and its entertainment value. Thanks for the pointers to your book, “Rad Decision: A Novel of Nuclear Power”. The reviews seem very positive! I’ll add it to my (ever-lengthening…) list of books that I intend to read.